Both of his hands are bent inwards as well as his feet; though his feet, slightly. His hands cannot hold a pen so instead, he uses his feet to write his notes in class. He said it has been like that since he was born but the doctors said his feet can still be corrected through surgery. Mark Chester Cabigao is a grade 6 student of Balaybay Elementary School in Castillejos, Zambales. Despite his condition, his teacher said he writes faster than the other students. His classmates are kind to him and he is also very friendly to all of them. Mark may have this condition but everybody in the school has accepted him and supports him. Recently, Mark’s school became the beneficiary of Programa Genio, a special project under ABS-CBN Lingkod Kapamilya Foundation's Operation Sagip. 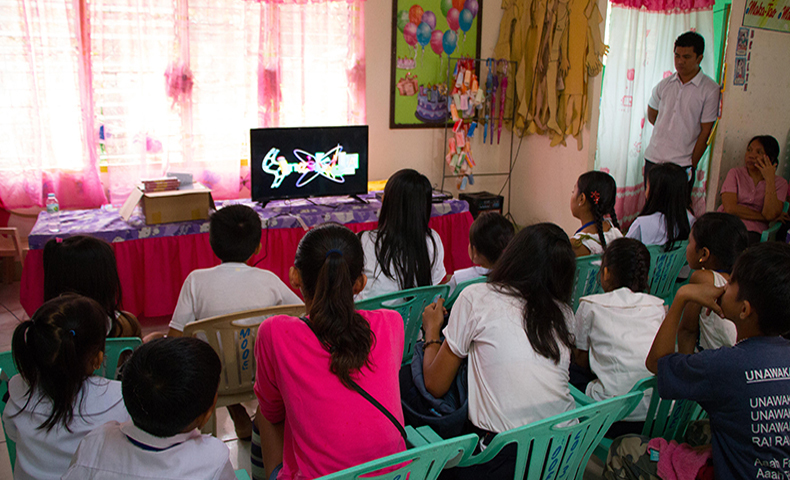 The school was given an educational television package through the generosity of Ramon Tolentino and his family. An ETV package has DVD materials of educational shows that were developed to enhance learning through multi-media – Sineskwela (Science), MathTinik (Mathematics), Hiraya Manawari (Values Education), Bayani (Philippine History), and Epol Apple (English). It also includes a 32-inch television and a DVD player. Ramon Tolentino is an overseas Filipino worker in the Middle East for the past 20 years. “He thought that it is time to give back to the school that nourished my love for education,” his wife Rowena said. Kuya Ramon, as he was fondly called by the teachers, is an alumnus of the school and the class valedictorian. 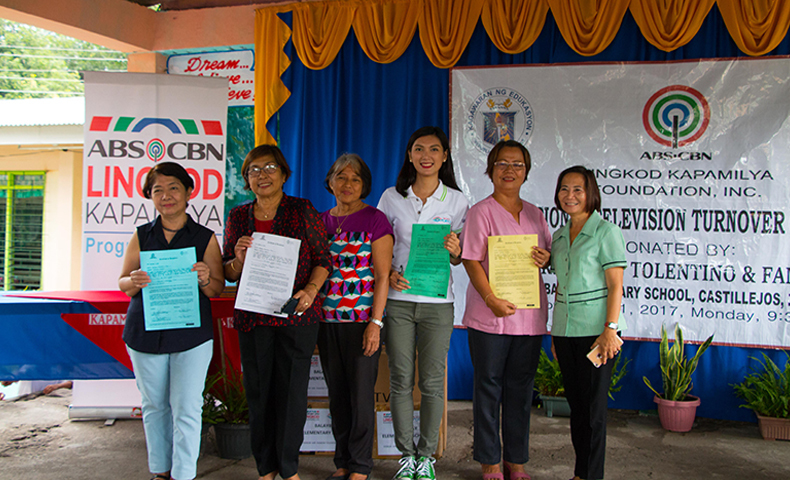 Rowena Tolentino (leftmost), the spouse of donor Ramon Tolentino with sister-in-law, Balaybay ES’s school faculty headed by its Principal Josephine Ragasa, Dr. Zenia Mostoles, Schools Division Superintendent, and Katrina Constantino, Programa Genio’s Admin Assistant during the turn-over of ETV package. For students like Mark, his former teacher Rosalina Lorion said that the ETV package will encourage students to study better. Since the package allows them to see and learn through the audio-visual materials, they will have a better understanding of their lessons. Mark was all smiles when he saw the package. He knows that aside from writing his lessons, he will be able to learn more about their classes because of the ETV package they were given. There were no lanterns nor Christmas lights nor Yuletide trees during that day. But with less than a hundred days before Christmas Eve, the ETV package was indeed an early Christmas gift to everyone in Balaybay Elementary School. For more information about the ETV package, visit www.abs-cbnfoundation.com.